Request an Appointment or contact us by phone and mention this special offer to get 40% off your first visit. 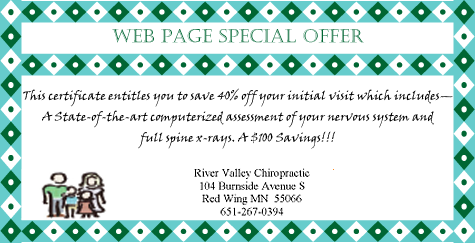 River Valley Chiropractic offers our patient form(s) online so they can be completed it in the convenience of your own home or office. OUR MISSION is to educate as many people as we can. Therefore we go to extraordinary measures to inform and educate our people of our communities on how to achieve optimum health. is help our practice members and members of our community to reach their highest health potential. We are dedicated to improving the function of their body's nervous system through chiropractic, improving their body's movement pattern's through personal training, improving their eating habits through nutritional coaching, and helping to decrease stress in their body through massage. OUR VISION is to educate as many people as we can. Therefore we go to extraordinary measures to inform and educate our people of our communities on how to achieve optimum health. We incorporate having a healthy nervous system with having healthy movement patterns with healthy eating habits. These are 3 essential elements to optimal health. No one in our area offers this complete service. We use the latest advancement in spinal nervous system examination equipment to evaluate and monitor your health. The Insight Subluxation Station is the only technology of its kind certified by the NASA Space Foundation. The Insight Subluxation Station address the need for objective evaluation of neuro-spinal function related to the subluxation. X-ray allows us to utilize advanced imaging to assess the biomechanical structure and function of the spine. These tools allow us to accurately locate, assess, and monitor the damage being caused by the subluxation. The Gonstead Chiropractic Technique is a specialized chiropractic technique that takes extra training to learn. It focuses on locating and correcting interference to your nervous system caused by subluxations. 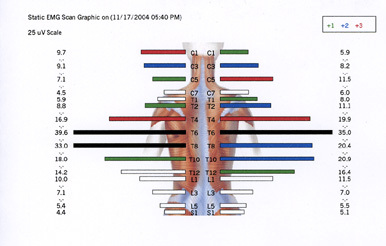 Functional Movement Screen is a thorough assessment of the movement pattern in your body. It allows us to evaluate every movement pattern in your body looking for asymmetries, dysfunctional patterns, and weaknesses. This allows us to create a specific plan to help restore normal function to your body quicker, prevent future injuries, improve your body's strength, mobility, and stability. o one in our area offers this complete service. Our office specializes in the Gonstead Method of chiropractic, which was created by Dr. C. S. Gonstead in 1923. 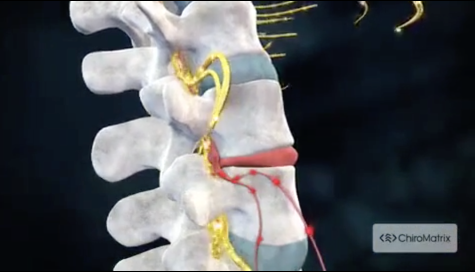 It is a specific approach to care for the human spine and address the areas that have become SUBLUXATED causing nerve interference. Our office has been serving our community since 1998. Our off has the amazing opportunity to serve and care for over 13,000 practice members that River Valley Chiropractic serves! HEALTH is not simply about being living pain free. OPTIMUM HEALTH is about allowing your body to have optimum function. Enjoy full life expression with regular chiropractic care, personal training, healthy eating, and massage. ATTENTION! CLICK BELOW TO SEE IMPORTANT ARTICLES PERTAINING TO YOUR HEALTH. Request an Appointment or contact us by phone and mention this special offer for a 40% discount on your first visit. That's a complete consultation, spinal examination, State-of-the-Art computerized assessment of your nervous system and full spine x-rays for just $156 (normally $260). "It is welcoming and focused on your wellness. They can help you with nutrition, exercise, relaxation, and an overall feeling of health."